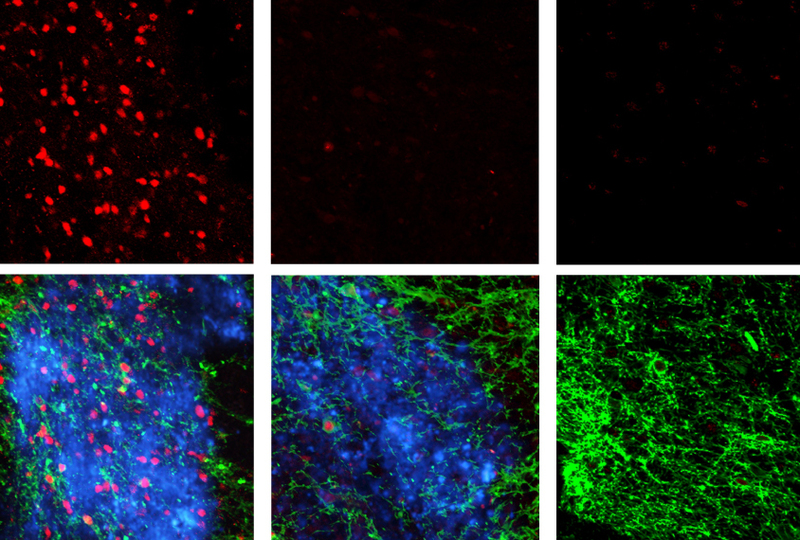 Light, protein, action: Tiny particles (blue), along with light-sensitive proteins (green) and light, excite neurons (red) in a reward region of the mouse brain. A new technology that converts near-infrared light to visible light can manipulate neurons nestled deep in the brain1. The approach provides a noninvasive way to study the brain and, ultimately, help develop treatments for brain conditions. A well-established technique called optogenetics already enables researchers to control neurons’ activity using visible light. But visible light cannot reach deep brain tissue, so scientists have to insert optical fibers to deliver light into the brain’s recesses. In the new work, researchers developed custom nanoparticles — tiny crystals one-billionth of a meter wide — as an alternative to optical fibers. These particles absorb near-infrared light, which can penetrate several millimeters into the brain, and then emit visible light. The light either excites or inhibits neurons engineered to carry light-sensitive proteins. The researchers coated the nanoparticles in silica and added chemicals called lanthanides, which allow the nanoparticles to absorb and emit energy. They can control the color of light the nanoparticles release by changing the number or type of lanthanide atoms. Last year, a separate research team reported using the technique to stimulate neurons in zebrafish larvae2. In the new study, the researchers tested the method in sedated mice. They first injected a protein sensitive to blue light into the ventral tegmental area, a deep-seated brain region that governs reward. Four weeks later, the researchers added the nanoparticles and used a laser to shine near-infrared light into the brains of the mice from 2 millimeters above their heads. The researchers saw neuronal activity in this area. They stimulated other deep brain regions using various combinations of proteins and lanthanides. They also tested the technology in alert mice. They injected the nanoparticles into the hippocampus, the brain’s memory center, and trained the mice to fear a sound by pairing it with an electric shock. The mice then froze in response to near-infrared light in the absence of the sound, indicating that the light had activated the neurons responsible for the fear memory. The results appeared 9 February in Science.